In today’s business world trust plays an important role, especially in building a long-term business relationship with clients & customers. Usually, the sales & marketing personnel for most companies avoid adopting such sales/purchase related practices. Trust is the most valuable commodity in this Business World, when it comes to the Purchase & Implementation of the ERP solutions. It is important to have the Right ERP solution in the organization by the Trusted and Appropriate Solution Partner. 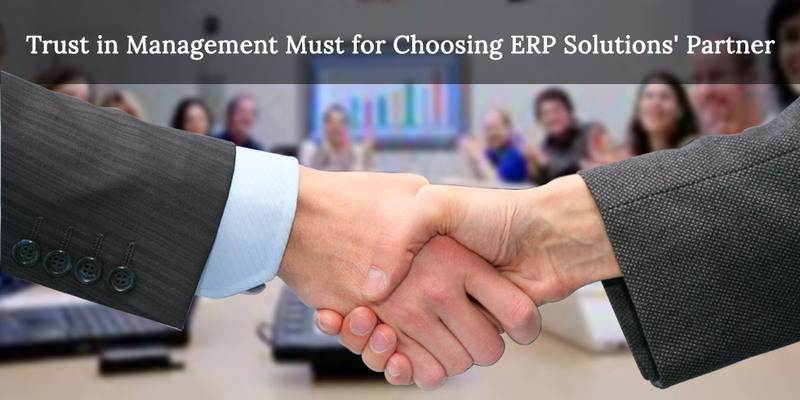 Organizations are apprehensive about choosing the right ERP solution as well as the Right Solution Partner due to their past experiences that cannot be termed as good or some appalling word of mouth. Due to inept practices, lack of trust and less involvement from the management of the ERP solution provider, some organization feel hesitant in purchasing the ERP solution. They are always clouded by the question whether the ERP solution will be a success or not. So, these things indirectly affect the business growth and stretch the purchase & sales cycle. Sales & Marketing personnel are with the company for a specific period, while the Organization’s Management is a permanent affair. So, the involvement and trust by management do the crucial role in ERP Sales/Purchase Cycle. The SAP Business One ERP is a completely integrated & customizable solution which will lead to continuous business growth. Silver Touch offers all services for SAP Business One from license procurement to training & support services. Silver Touch management provides complete trust and assures to their clients for providing best services at all times. Silver Touch is having 7+ years of implementing SAP B1 Solutions with 100% customer satisfaction.